It’s called adaptive designer clothing for children, a fashion brand by Tommy Hilfiger. They have washable magnets instead of buttons, adjustable pant legs to fit foot braces and, and waistbands are fully adjustable — which is ideal for children who have a length difference between limbs or low muscle tone. This is a big deal for children, their parents, and the fashion industry in general. It's the first time a major clothing line, let alone a designer one, has created clothing for people with different abilities. The collection includes 22 pieces for boys and girls, sizes 4 to 20. 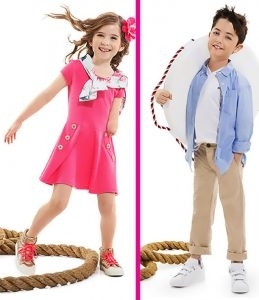 The tops, pants, jeans, and dresses are adaptations of other Tommy Hilfiger styles and the same price as the brand's standard children's styles.